Atta’a is here to give Palestinian residents of East Jerusalem the information they need to help them in their everyday lives. One of the simplest, but most useful – and most popular – ways to do this is through short videos. This video, for example, showed how to go to the Municipality. 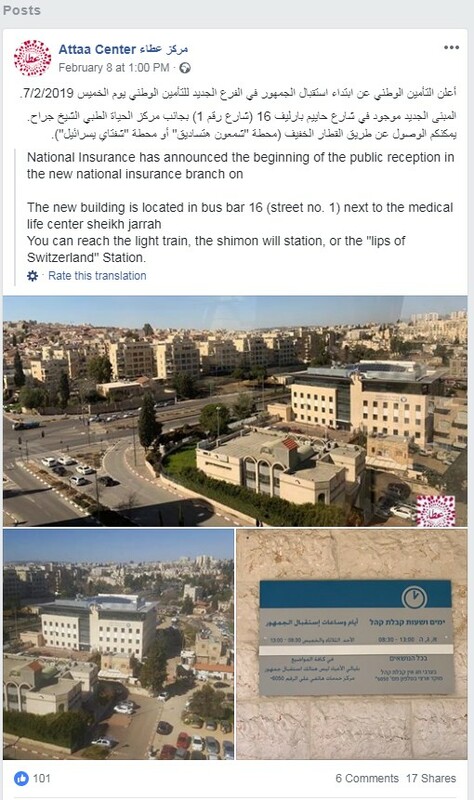 And the newest video, below, shows how to get to the National Insurance Institute’s new offices in East Jerusalem. The National Insurance Institute is an important national welfare agency, and many residents are eligible for benefits and payments. 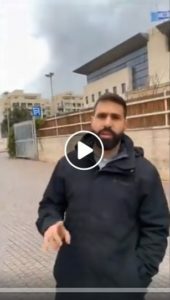 Here’s the video from the Facebook page. Thus far, we know that some 30,000 people have seen the video, and it’s been ‘shared’ 90 times!!! Many thanks to the Leichtag Foundation and the Jerusalem Foundation for their continued support of Atta’a. 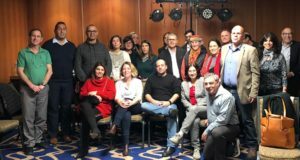 We’ve mentioned here and here how 0202 – Points of View from Jerusalem has become a significant news source for many – including major Israeli journalists. 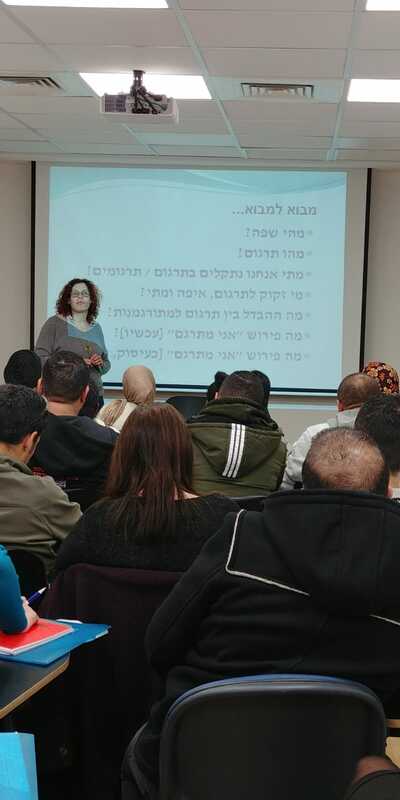 Part of learning about how to make Jerusalem a clean city is also learning about what works. One of the goals set out in the Little Prince’s one-year anniversary celebration last July was to learn from other successes. And Rishon Lezion is ranked the cleanest city in Israel according to national indicators. So we went to Rishon Lezion to learn what they do well. We went with a group of Municipality officials – both elected and professional – including David Zohar, a city council representative from the Haredi Degel Hatorah party. 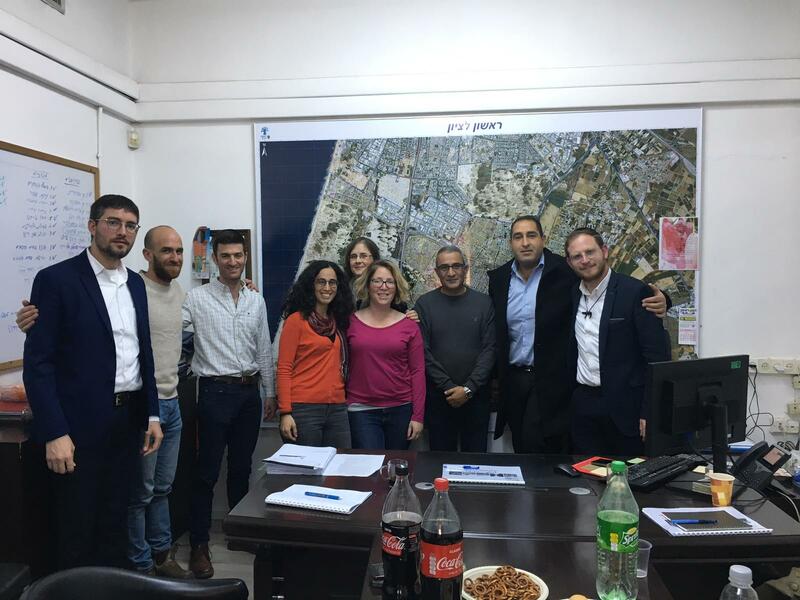 We discussed the actions that the Rishon Lezion municipality takes in order to keep its streets clean – the amount of resources it dedicates to the field, the number of sanitation works, the number of overseers, the level of enforcement, (They give out 4,600 tickets each year, just to people who don’t clean up after their dogs!) – all of which are significant, and significantly higher per capita than many cities in Israel, including in Jerusalem. There is a great deal of planning and strategic thinking, both within municipal departments and in cross-department cooperation. Residents are also considered full partners in the effort to keep Rishon Lezion clean. As a result of hard work and careful planning and cooperative work, the Director of Rishon Lezion’s Environment Division has been able to instill a sense of pride among sanitation workers, which is rare for that municipal branch. There is even a mechanism for measurement and reward for outstanding workers. It was fascinating and inspiring. Next step – Jerusalem! Many thanks to the Rayne Foundation for their support of the Little Prince. And to the Jerusalem Foundation for its support of activism throughout Jerusalem. Congratulations Little Prince! As a result of all its hard work, the new city administration has chosen a Clean City as a main, central objective! This means that all Department Directors are now busy writing work plans on how to implement Clean City programming in their departments – from sanitation to city beautification, enforcement to education, welfare to culture, public buildings, and more. In addition, the Municipality has received an additional 52 million NIS to the Clean City budget, and Mayor Lion is addressing the target of a Clean City from a range of angles – not only garbage collection, but also public gardens, courtyards, enforcement, supervision, education and awareness-raising, improving infrastructure, improving procedures, and more. We had to celebrate that accomplishment. So on February 4, we rented a party room at the Inbal Hotel, with a rich variety of refreshments. 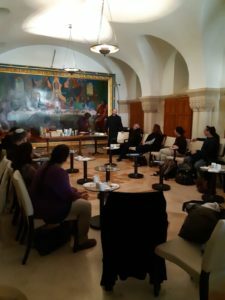 Activists from the Arab, Haredi and ‘general’ Jewish sectors spoke about their experiences thus far, and their visions for the future. We also invited the Playback Theater, which gave a fantastic performance! Who knew trash could be so funny? Many thanks to the Rayne Foundation for its support of the Little Prince. And to the Jerusalem Foundation for its support for encouraging activism in Jerusalem. 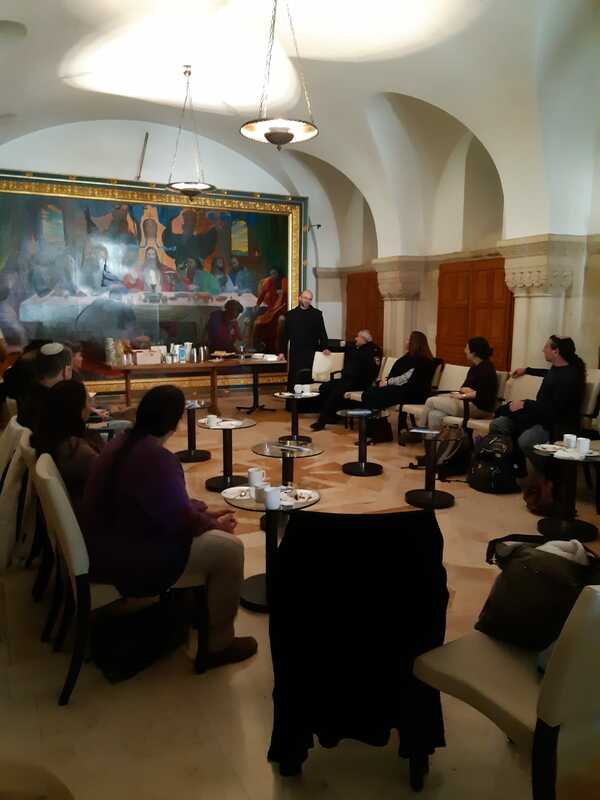 We’ve been working with the Benedictine monks at the Dormition Abbey, as part of the Window to Mount Zion project, since the project’s inception. On Thursday, February 21, they wanted to say thank you. They invited project volunteers for cake, coffee, and a tour of the Dormition Abbey. 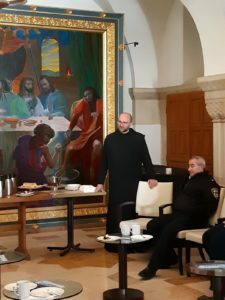 Led by Father Daniel, who is in charge of relationships with the Israeli community, the 20 participants enjoyed stories from within the Abbey – about the monks’ daily lives, about the artwork that adorns the walls and halls. Father Daniel also told of his experiences as a Polish monk in a German monastery. We also enjoyed the view from the top of the Abbey’s tower. It was important for the monks to express their thanks to the hard-won feeling of cooperation and teamwork among volunteers and Mount Zion residents that enables all groups and religions to share Mount Zion in peace. Thank you Father Daniel – and the rest of the Dormition Abbey community – for opening your home up to us. It was a fascinating visit! Thanks also to all our partners on Mount Zion – it’s amazing to look back and see how far we’ve come! The Atta’a Assistance Center for the Rights of East Jerusalem Residents has a variety of activities that aim to advance rights realization – from one-on-one assistance, awareness-raising lectures, help online. 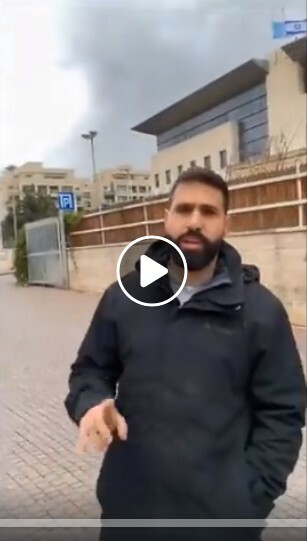 One of its main channels in recent years has been making the wealth of information accessible to East Jerusalem residents – especially online – via the Internet and social media. Sometimes it just takes one Facebook post to reach the huge impact you were looking for. On the other hand, this information is so important to the 350,000 Palestinian residents of East Jerusalem who need to contact the NII. They posted it on their Facebook page, and over 13,000 (!) people viewed that post on their Facebook page alone! 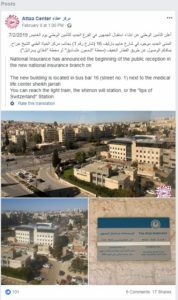 They also posted to other popular East Jerusalem Facebook pages, where even more residents saw it. It’s always great to see when Atta’a’s activities have an impact. You can read more about that impact here. Many thanks to the Leichtag and Jerusalem Foundations for their support of Atta’a. We’ve described here and here some of our latest efforts to make Jerusalem a clean city, thanks to the efforts of the Little Prince – Cleaning Up Jerusalem Together initiative. Last Friday, on February 22, 2019, Shlomi Buchnik published this opinion piece on the MyNet web site, which is associated with the popular Ynet web site. You can read the Hebrew here. As we can read, the buzz of the Little Prince is deep into this new municipal administration! Hope the buzz will turn into actual outcomes in the streets soon! The truth is, I did not believe any of the promises of Moshe Leon’s election. I must admit there is something in his clean vision that even bored me. But perhaps after Barkat’s dramatic roller coaster, this silence is blessed. I remind you of my sins today: I did not believe any of the promises of the municipal elections that accompanied us in the past year, and especially not those of Moshe Leon. I read them with a mocking smile. After every promise I hastened to explain why I did not believe them. I could not believe it when he talked about free parking, and certainly not the one that promised to improve cleanliness. I did not think he would get rid of garbage in the streets, and it seemed absurd to me that he would evacuate garbage daily in areas where people go out. I must admit that there is something in Leon’s clean vision that even bored me. How do you compare the excitement of Formula 1 or the Marathon to thrill of an empty trash can? 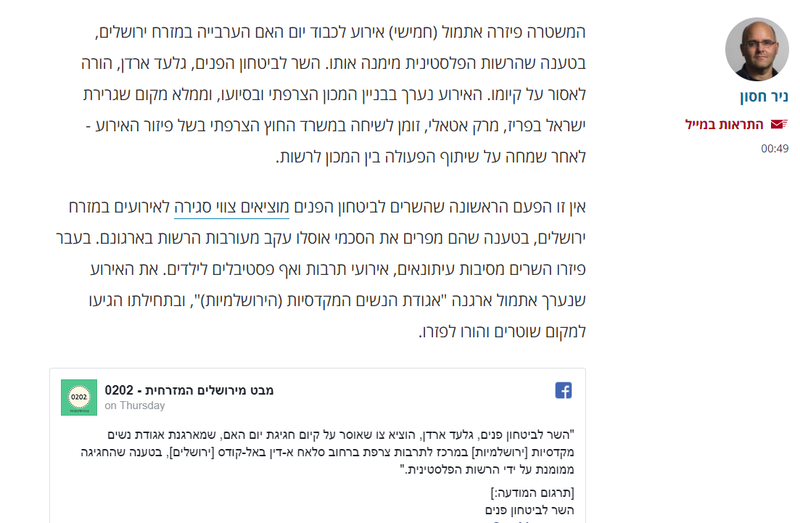 In my shallow eyes, I preferred the approach of his predecessor, Nir Barkat, who sometimes did not seem interested in the daily troubles of the Jerusalem resident, but at least he gave us the feeling that we live in a European capital. The problem is that, like Cinderella, at midnight (and perhaps a little before) we returned to reality. Barkat did invest in a revolutionary program to clean up the city, but the Machane Yehuda Shuk remains dirty. The ultra-Orthodox neighborhoods were filthy, and the garbage activists were often forced to replace the Jerusalem Municipality. When a Jerusalemite wanted to solve the local garbage problem, he preferred to turn to the Little Prince and Jerusalem of Garbage, groups that the residents established to solve the problem. This week I sat down to talk to an old friend who has been an activist for clean streets even longer. In recent years, the conversations with him were stinking, literally and figuratively. They dealt with the sorry state of municipal garbage, which bothered him more than the access highways to the city or the housing problem. “I live in an ultra-Orthodox neighborhood and feel that I live in a perpetual garbage dump,” he always said. This week my friend smiled when he talked about the garbage situation in the streets. This hasn’t happened in a decade. He explained that since Moshe Leon was elected, the response to sanitation complaints has changed. He has been invited to meetings that deal with the subject in local community centers, and even takes care of dog feces. “Do not be mistaken, there are still quite a few things to do, but I feel that if we continue like this, we’re moving in the right direction,” he explained to me. City sanitation workers speak enthusiastically about the changing atmosphere. They tell of direction from above that cleanliness is more important than anything. Some explain that Nir Barkat began this last year, but everyone is aware that Leon accepts no compromises. “In the past month, we have been cleaning areas that we have not been in for years. We’ve found trash that’s ten years old,” said one of them. Leon’s hundred days of grace ended this week. I promised myself that I would not criticize him during this time. I was convinced that at the end of that time I would stand with a bag and criticize him for everything he’s done. Like many of the city’s residents, I was afraid as well. 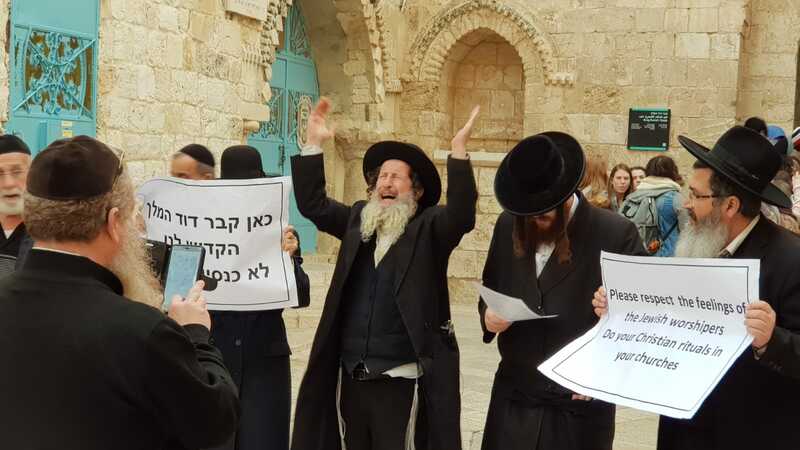 Less because of an increasing religiosity of the city and the alliance with the ultra-Orthodox, and more because of fears of ethical practices. Today, three months after he was elected, I can say that I feel positive winds of change from Safra Square, especially in the area of cleanliness. There are no strikes that threaten the Finance Minister, no struggles with the heads of community centers, and even the mini-drama in the Shuk ended long before it was exciting. Moshe Leon still isn’t a visionary. He has no dreams that will excite the Jerusalemites. It’s also clear to me that three months is too little time to completely believe in him, and I promise to be there to make sure he does not fall and does not tire of keeping his morals. But perhaps after the dramatic roller coaster provided by Barkat, this silence is blessed. And perhaps this is our opportunity to give a first and clean opportunity to Moshe Leon. Many thanks to the Rayne Foundation for their support of the Little Prince, as well as to the Jerusalem Foundation, for their support in developing activism in Jerusalem. Have you ever waited for a doctor’s appointment at an outpatient clinic and the nurse comes out and asks, “Can someone help us in translating into Arabic / Russian/ Amharic / French?” Usually, a passer-by will volunteer to help translate the conversation between the specialist and the embarrassed patient, whose secrets are now being exposed to an inexperienced stranger at best. Research tells us the chances are that the quality of translation will be poor, and the chances of making a mistake in such a non-professional translation are very high. And who knows what the quality of health care will be like? 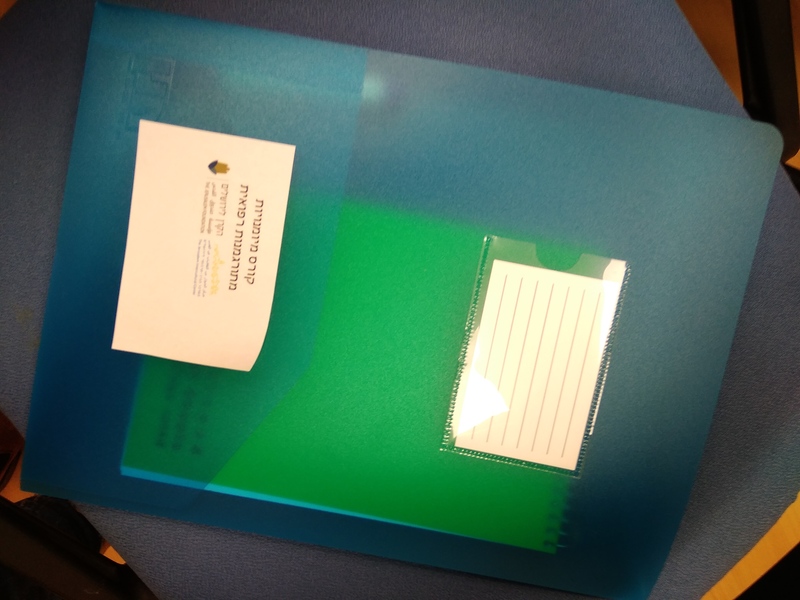 In January 2019 we opened another course for medical interpreting (i.e. oral translation) skills for medical professionals and volunteers in Jerusalem hospitals. There, the 30 participants are learning to do it right. (because even the Russian and Hebrew-speaking nurse will interpret poorly if he or she hasn’t learned best practices, ethics and proper terminology.) Participants come from Hadassah, Sha’are Zedek, ALYN Rehabilitative Hospitals. There are also some independent participants. The team working with Michal are the language experts: Tanya Voinova, Salih Sawaed and Messale Mamo. 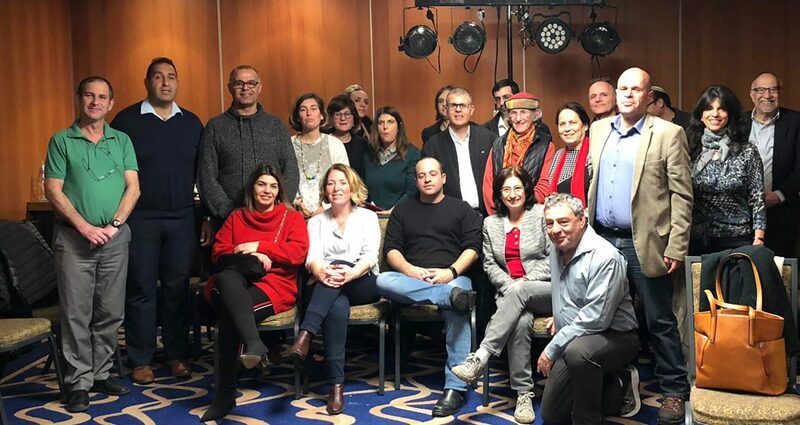 One more step in making Jerusalem friendlier – and more culturally competent and culturally sensitive – to all its residents. 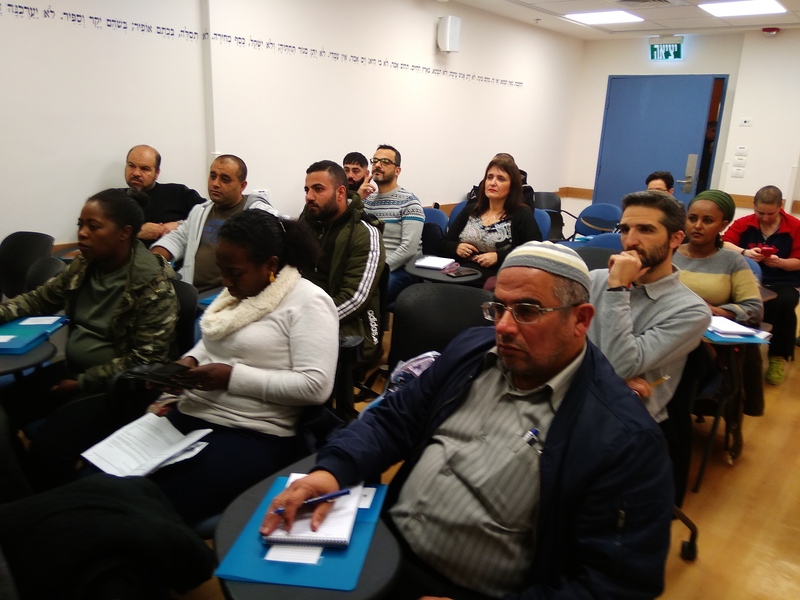 This course could not have taken place without the partnership of the Jerusalem Foundation, our strategic partner in Cultural Competency for over a decade. 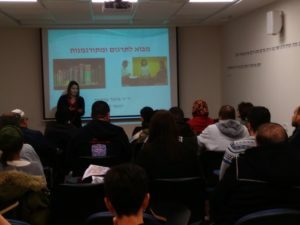 And many thanks to our partners in action Sha’are Zedek Medical Center (who are graciously hosting the course), Hadassah Medical Center, and Alyn Pediatric and Adolescent Rehabilitation Center. What is the secret to successful management? Cultural Competency, of course! Dr. Be’eri spoke about female leadership in medicine as both an allegory and a challenge. The challenge – the fact that there are only 4 directors of public hospitals throughout Israel. Or the fact that there is another – male – Dr. Be’eri who is a Department Director, and he is referred to as “Dr. Be’eri” while she is referred to as “Dr. Maurit.” But the lesson? The main example she brought as successful lesson of female leadership – was Cultural Competency, which we’ve been privileged to be a part of since ALYN began the process more than 10 years ago. Her main message: Women manage differently than men. When we allow ourselves to manage as women, we are more flexible, open and sensitive. When we keep lines of communication open between administration, staff, and patients and their families, asking for opinions and input – and fostering Cultural Competency – together, the hospital will move forward. Thank you, Dr. Maurit, for showcasing Cultural Competency at this important conference. Thank you to the Jerusalem Foundation for its continuous support of cultural competency since its inception. Want to learn more about the conference? You can read more here. 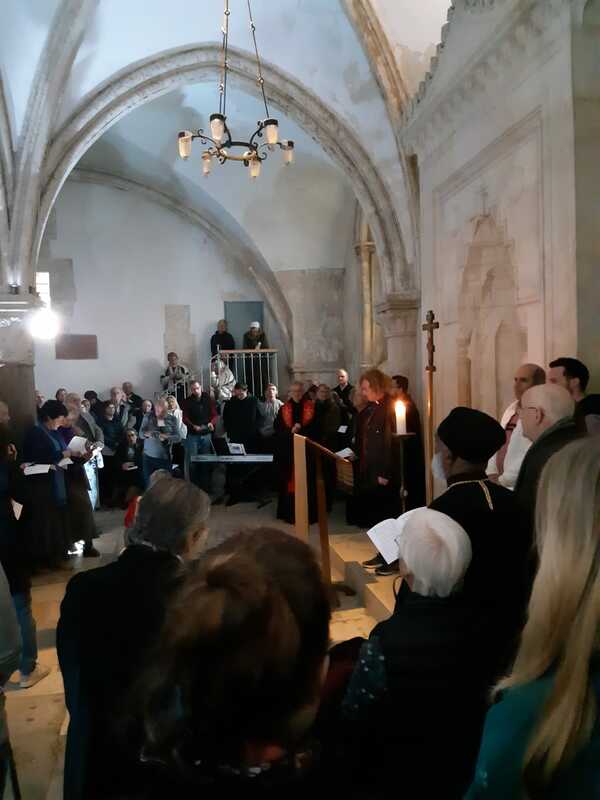 On Thursday, January 24, Window to Mount Zion volunteers again helped local Christian clergy, followers and tourists celebrate the ceremony of Praying for Church Unity. In the past, people who’ve gathered outside actually disturbed the ceremony inside. There were still protesters, but it didn’t bother the ceremony. Kind David’s tomb has not been a church since 1521, when the Muslims converted it into a mosque. But it was built as a church during the Crusader period on the foundations of the Byzantine Hagia Zion church. 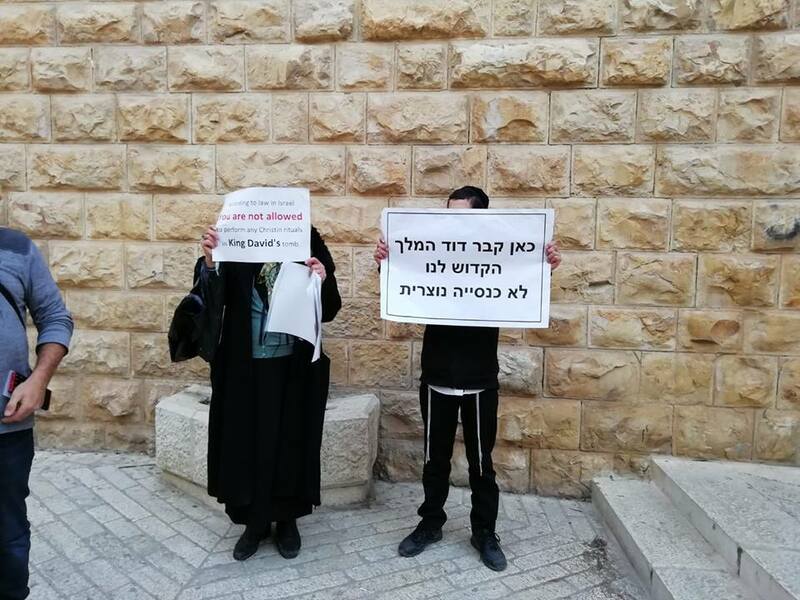 Despite the English sign, there is no law in Israel forbidding a Christian ceremony at David’s Tomb, but since 1948 David’s Tomb has been run by the Religious Affairs Ministry (the National Authority for the Holy Places). It is usually used as a place of Jewish worship, and allows members of different religions to visit. 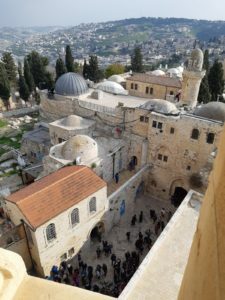 Once a year, the State of Israel allows the Greek Orthodox Patriarchate to visit David’s Tomb as part of the Shavuot procession on the second day of the festival. So what caused the two people to stand with these signs last Thursday near the entrance to the Tomb of David? 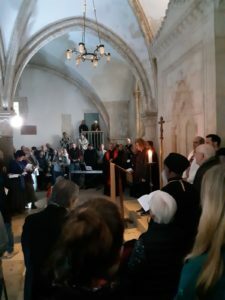 On the second floor of the building, which was built as a Crusader church on Byzantine foundations, became a mosque in the 16th century and was expropriated by the State of Israel after 1948, is the Room of the Last Supper and the Holy Spirit. It is a very important site for Christians of all denominations. Since the site is managed by the State of Israel (the Ministry of Religious Affairs and today the Ministry of the Interior), the State of Israel has continued the status quo and enabled Christians to visit the site, a short and quiet prayer (as explained at the entrance) and several times a year they can hold short prayers on relevant days. The State of Israel also allowed the Christians to hold a joint prayer for the unity of the churches that has existed for decades. But in recent years, in the light of the Franciscans’ appeal to allow them to pray under certain circumstances in the Room of the Last Supper, a request that, by the way, had not yet been answered, rumors circulated about the requests of various churches regarding the Last Supper Room. Some of the rumors have also spread to the first floor and people can still be heard about how the Vatican sought to buy David’s Tomb or whether the pope made his 2014 visit conditional on receiving the keys to the tomb. But there was nothing to those rumors. 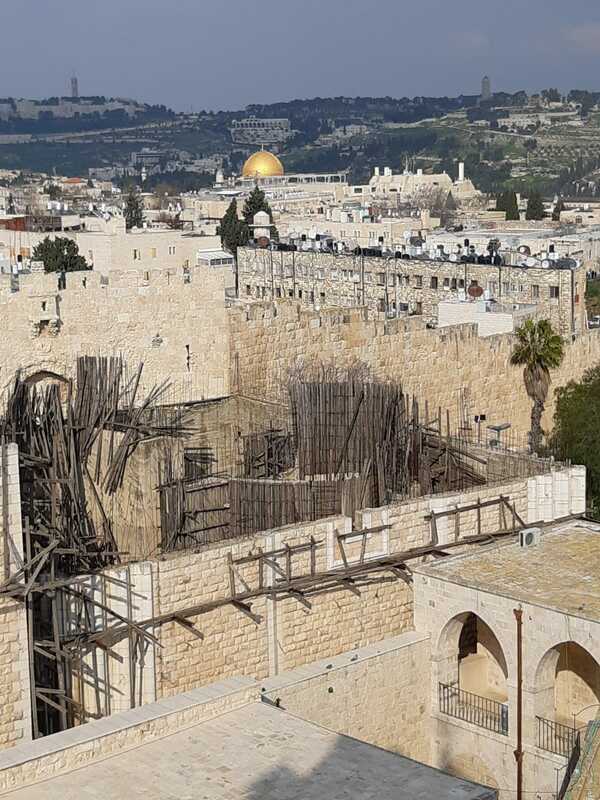 The Franciscans had already tried to return the site to their control under the British Mandate – since they had bought outright in 1333 – and failed. At the moment there is no change in the status quo regarding the prayers on the spot. The tension generated by the project led to the creation of the Window to Mount Zion project (https://www.mountzion.org.il), which aims to create a dialogue among residents on the mount, promote an atmosphere of mutual respect between the citrus and the visitors, and deepen our knowledge and understanding of the complex. 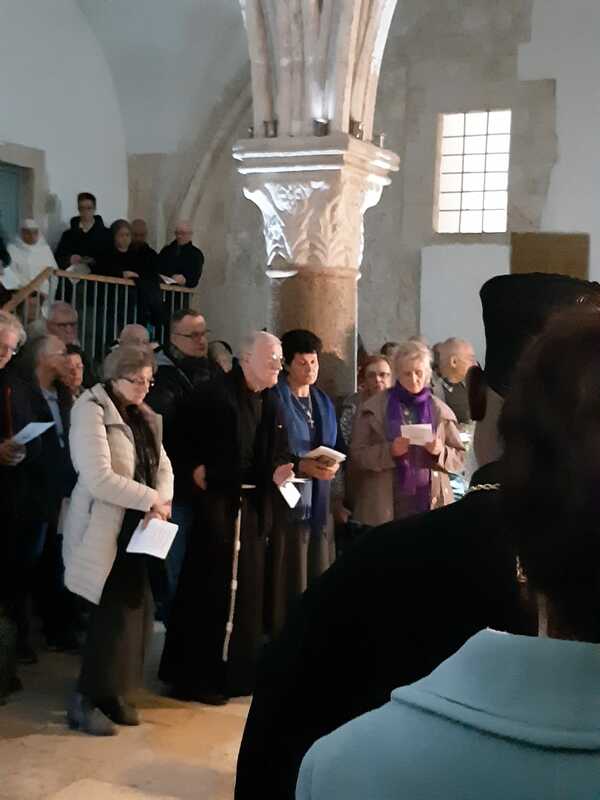 Every year, volunteers from the window to Mount Zion arrive on these sensitive days, where Christians are permitted to hold a short prayer in the Room of the Last Supper, and help the policemen maintain a calm and dignified atmosphere. They talk to those who come to protest, explain to the surprised tourists why the site is closed for visits during the prayer, and talk to the local Christians who are happy to see that Israeli Jews care about them, the Jewish worshipers and Jerusalem. Thanks to the many volunteers who make this project possible! © All Rights Reserved, the Jerusalem Intercultural Center.